Growing up in a more rural area, I saw lots of wildlife in the forests and open fields around the house. Coming to the city, I didn't expect the diversity and quantity of birds and animals that adapt and live here. 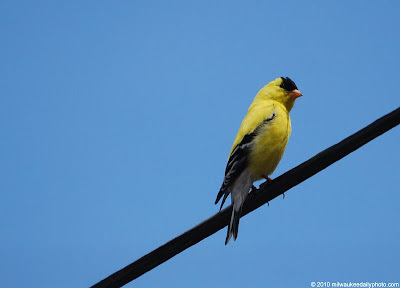 This goldfinch lives in our neighborhood, and visits quite often. He was kind enough to wait for me to go into the house and get my camera to take a few photos. Great clarity and color. Great photo.